where every condo has an OCEANVIEW! ALOHA and WELCOME to Napili Point Resort! Enjoy some of the best snorkeling and swimming on Maui in Honokeana Bay. Multi-colored coral and countless tropical fish and sea turtles await you in the Bay – literally just steps outside your door. It’s like an aquarium except that it’s entirely natural and you swim among the fish and coral instead of looking through a window! At the tip of our “point”, you will find tide pools filled with crabs, tiny hatchling tropical fish and countless other species to investigate. It’s a great place to enjoy the natural beauty of the sea while only getting your feet wet! A 3-5 minute walk along an ocean front path away from our resort, is the sandy crescent beach of Napili Bay. 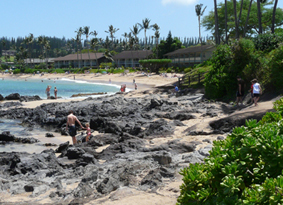 Napili Bay beach is another favorite place of our guests to snorkel and swim. PARADISE FROM A NEW POINT OF VIEW!